I know people who take the time to put stickers like this on their car in the first place, probably do believe in what it says. It’s a way for them to broadcast their position on the subject. Maybe the person wants it to have some sort of shock value. I’m all for all forms of free speech, but this caused me to ask, What is the purpose of this message? Is it really going to have the effect that’s intended? Most people will see this bumper sticker and either agree with it or think the person who put it on their car is a crazy fanatic. If they agree with the message, then it really wasn’t intended for them in the first place. If they don’t agree with the message, are they really going to change their thinking and behavior with this message ?!? 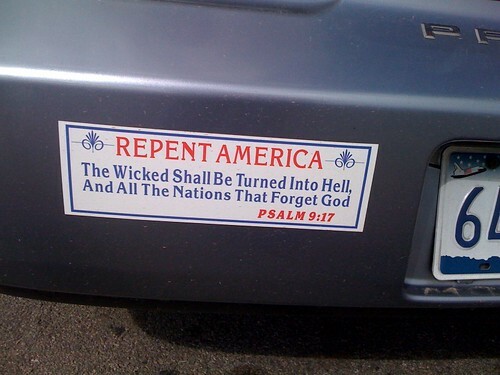 I must confess: I really dislike bumper sticker theology. More often than not, the sentiment is offensive and dismissive. Often the message is judgmental and pejorative. It rarely invites dialogue and most often is condemning. Very often the verse or passage of Scripture is lifted out of its context, only to be used to say something that may or may not have anything to do with what it means within its context! That’s called proof-texting, using a quotation to substantiate an opinion or position. I was hoping the owner of the car would be around when I came out of the store. I wanted to ask them about the bumper sticker and, maybe even have a thoughtful conversation. But alas, no one was there.